I read about and saw pictures of gorgeous flaxseed ryes coming out of members' ovens last week and I thought I'd give it a try, but I don't like to bring new flours or specialty ingredients into the house until I use up much of what I already have. Such is life in a small New York City kitchen. Finding no rye and no flaxseeds, flaxseed rye was pretty much out of the question. There was some flaxseed meal, though, and a nice bag of Central Milling whole wheat, so I went that way. 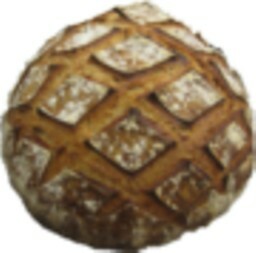 I fed my 100% hydration white storage culture with the whole wheat a few times and mixed up a stiff levain from it to ferment overnight. I made a hot soaker with the flaxseed meal and hydrated all the white bread flour overnight. Bulk fermentation was two hours, with s&f's at 30, 60, and 105 minutes. Shaped loaves proofed another two hours on the bench. I put a total of about 2 ounces each of flaxssed meal (via the soaker) and buckwheat flour in the mix. The large loaf was baked covered in cast iron, from which I'm getting good results recently. The smaller loaves were baked with my usual steam setup, but not covered. They did not exhibit the same cell structure as the larger loaf. The crumb on these is very light. There is no bitterness or excessive tang from the whole wheat. I tried to be conservative with the fermentation and proofing times. Delicious with good butter, cheese or maybe smoked fish. Will make these again. looking loaves lb. You prove nice bread that tastes good can come from from what ever you have on hand if you kow the right techniques. I appreciate the encouragement. There are times when I need it. The flaxseed meal has a nice texture, gives some taste, whcih the seeds don't really do, has all the health benefits. That said, I wouldn't mind some crunch ina bread like this once in a while. 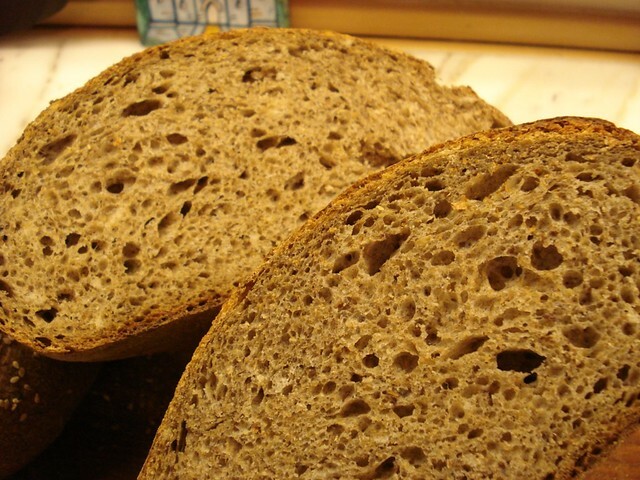 I throw buckwheat into my dark breads often for the wonderful flavor. I've said before, though, that it can be like working with wet cement. I'm glad you like the "scallop shell" scoring. It's pretty easy and makes a nice presentation. The internet brings ingredients to everyone these days, but I am a native New Yorker, so my psyche is hardwired into the city, for better or worse, much more often better. Beautiful looking loaves, Louie! I , too, like the scoring on the boule. How lovely to improvise with what is in stock. You did an absolutely nice job. The crumb is nicely uniform and open. While you were at it, did you write down the measurements? The proportions are basically those of Hamelman's flaxseed rye. I expanded them by eye for more dough to work with and, as I mentioned, I hydrated the white bread flour overnight. If you do this, be sure it is completely incorporated in the final mix. I paid a price in this bake with little undissolved pieces. The s&f routine and fermentation times were based on my own experience in my kitchen. This last is something I've been concentrating on to good effect recently. Great looking bread Louie...your crust and crumb look perfect. Nice job.....I would kill for a slice versus the sad excuse for bread I am forced to eat on my business trip. I know how it can be, bad bread when traveling. Stop by here sometime for a slice! Let me know your coordinates so I can set my transporter! I'm currently in the car on a road in the middle of nowhere in Shenzhen China! Your breads look really good! and what a creative use of ingredients. It's always nice to hear from you. I try to make do with what I have on hand. Nothing gets thrown out in this house. Much appreciate your kind words, as ever. Beautiful breads Louie. Very attractive scoring patterns and that crumb is outstanding. I've been following your SFSD. It never ends, does it?